« Good Luck CFSF Affiliate Cup Team! I think you all will agree this is a no brainer…CrossFit Sioux Falls FTS!!! This was an amazing weekend for CrossFit Sioux Falls. This was the 1st step of putting CrossFit Sioux Falls on the CrossFit map. If you didn’t hear yet CFSF FTS competed in the Midwest Regional event to qualify for the Affiliate Cup for the CrossFit Games in July. The team went to Casterock CO and showed nothing but class, determination, teamwork, and gave it their all! However we did not qualify for the Games. They came back with a world of experience and a glimse of what victory will fill like this time around next year. When you see Annie, Mary, Liza, Nick, Browny, CPete and to the coaches Casey and Matty B this week give them a BIG thank you and congrats! And tell them how proud we are of them. We will keep you updated with any video’s and reports that hit this week about recapping this amazing event. -Everyone on FTS tell us about your experience this weekend in the comments. Saturday May 8th 8am Avera Breast Cancer Race. Click the Avera link to the right. We are wearing the “Stop the War in My Rack” slogan…Thanks Tracy K.
This entry was posted on May 3, 2010 at 7:55 pm and is filed under Members. You can follow any responses to this entry through the RSS 2.0 feed. You can leave a response, or trackback from your own site. I sat here for a couple of minutes just thinking about what I was going to write, but I’ll just keep it short and sweet…. The energy, the competitiveness, the determination, you name it…was like nothing I’ve ever experienced before. I thought I was hooked to Crossfit before, but I’ve never been able to really focus my love of Crossfit into a real goal until now. Now, I will be spending the next year of my life becoming stronger, more skilled, and better conditioned in order to achieve that goal. If you have an aspirations to make it to the games, now is the time to start training. So PROUD of you guys! I don’t think I can say it enough! You all put your heart and soul into this last weekend! You really proved what CFST is all about!! A well deserved athletes of the week!! You guys did a great job! I hope the experience was phenomenal! This post won’t do it justice…but I will try and sum it up. In a nutshell…this past weekend was f-ing brilliant. It’s easy to get tunnel vision and forget about the big picture. But as a coach, aspiring athlete, fan, friend, and fellow CrossFit’er, this weekend reignited my mad crush with the CrossFit lifestyle. Witnessing first hand the payoff of hard work and dedication had my heart racing many times over. Watching friends achieve goals and immediately make new ones was amazing. The focus, drive, heart, teamwork…you name it, was obvious. Watching a beast clean and jerk 355 was jaw dropping… watching a 95 pound woman pour her heart and soul into snatching her body weight over and over is something I will never forget. The buzz floating around that building was addicting…I can only hope to bring some of it back to the box here in Sioux Falls. I have no doubt CFSF will be well represented again next year, not only competing, but in the stands. No matter what the goal…CrossFit games athlete…lose a few pounds…or just find something to improve your life. Remember in the end you are part of something amazing. It will take A TON of work, a TON of dedication, but in the end the results are worth it. We can’t all be CrossFit games champions…but we can all be part of CrossFit. Quick highlight video of the weekend with our own Mike B rocking a muscle up included!! Rad work boy and girls!!! I loved living vicariously through Matt’s tweets, thought i was actually there! Badass lil vid of Browny rock’n the MU!!! As far as I’m concerned, you guys are AOWs EVERY week! You make us so proud!!! We are darn lucky to workout with you on a daily basis–your determination and dedication is inspirational!!! Love you guys!!! Soooooo proud of you guys!!!! You guys RTS!!! Of course, Matty B’s commentation was so flippin awesome it had me rollin at times! Awesome job to the coaches & team!! Well deserved!! I don’t know where to start! I saw so many athletes this last weekend competing with such heart. I have never in my life witnessed a community where you get done and then cheer for your opponent. Not only were the athletes amazing the judges were great. Constantly cheering you on and pushing you to your limits! I’ve never experienced anything like this before and I’m so grateful to have this experience. It shows that no matter how short, tall, little or big one is…you can accomplish anything. I learned the things that I need to work on for next year. I met people that love crossfit as much as I do. People are passionate, competitive, determined and just down right BAD ASSES! People that are just like the people of CFSF! Everyone should be proud of what they accomplish everyday at the gym! Thanks for all your support and for following us all weekend! It means a lot to the team! Thank you to Casey and Matt you two were fantastic. And last but not least thank you to my team mates! You all rock! This video is AWESOME! I have goose bumps just watching it. I’m so proud of all the CFSF competitors! From the National Anthem on Day #1 to the closing ceremony there was such an amazing buzz in that building. Having a complete stranger/competitor root you on when you are struggling to finish the MU portion of a WOD proved that this CF thing is truly about the community. Every competitor (Affiliate, Individual, Master’s Division) brought with them the experience from their home box. They poured out their heart and soul…and sometimes blood during the competition and left nothing for doubt. The look of accomplishment on the face of someone that snatched their body weight 20 times proved that heart and desire will knock down obstacles and barriers. My challenge to CFSF is to have a following next year similar to the CFOmaha or CFWindy City boxes…we wore the CFSF colors for everyone back in Sioux Falls that wasn’t able to make it this year…you will know you made the right decision the moment you walk through the doors of the event center next year…we belong there! I truly appreciate the opportunity to represent our box; you don’t know how much it meant to have those words of encouragement leading up to last weekend and the support we have received since our return. My vow and promise is to bring that intensity that I saw in Castle Rock to our classes. To Nick, CPete, Annie, Liza, Mary, Matt, and Casey…I am very proud to call you teammate and friend. First off I want to say that this past weekend has been one of the best experiences of my life! From start to finish I felt I was in an in awww state of mind! It was the first time in my life as a competitor that I wasn’t really nervous and I was just taking in this amazing experience each step of the way!!!! My favorite part of the whole experience was seeing the CrossFit Community’s support for every individual and truly having everyone’s back! It was amazing to watch the athletes in action and see how not only physically but mentally tough they were. No one ever gave up, no matter if they could do weight or not, they would just keep trying! This experience has truly taken me to the next level of my CrossFit Journey and made me stronger mentally and physically! I just want to tell you CFSF how much it meant to not only me but all of our teammates to have your support and constant reassurance through this whole process! We definitely felt the love and wanted to make our little box proud!!! 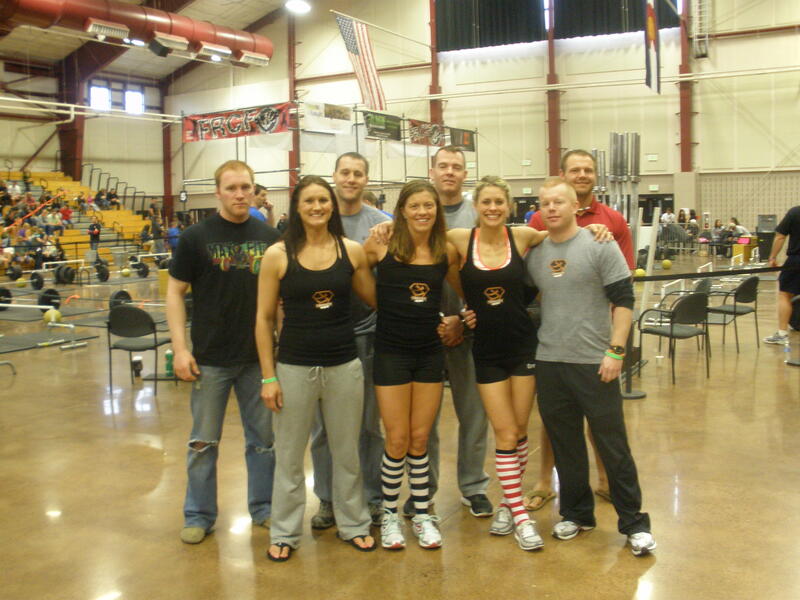 I also want to thank my teammates for pushing me always and making me a better CrossFitter!! You all inspire me everyday and I can’t wait to see your growth from this experience! To the Coaches (casey and matt), I really want to take this time to tell you how much you two mean to me and CFSF! 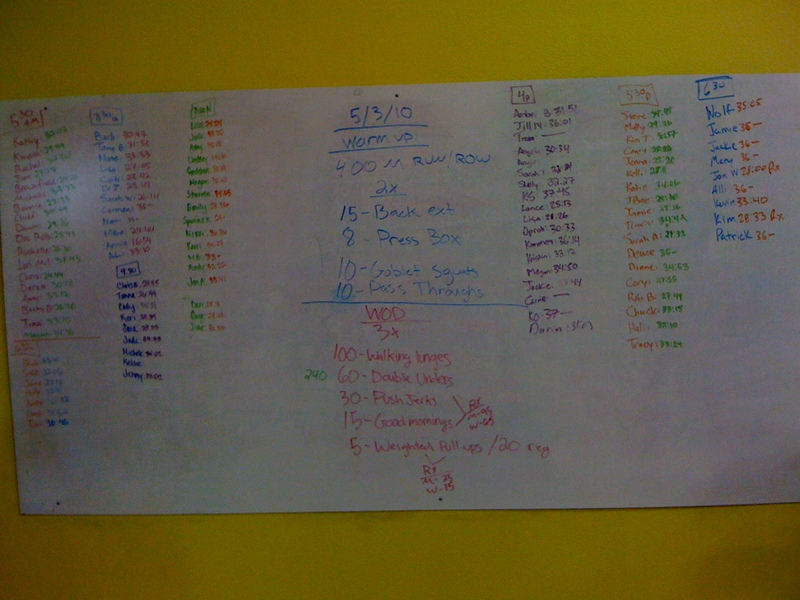 This is the first experience since we opened CrossFit that I have had people coach me and motivate me during WOD’s. Thank you for helping me to gain more confidence and motivate me for each and every WOD! It felt so great to have you right there by our side the whole weekend coaching us and cheering us on! YOu both have a true gift in coaching and I am looking forward to all the wonderful places you will take your gifts!!! Last I want to Thank my husband for supporting us and helping us to make this team happen!! You are such a motivator to this gym and myself and I would not be the athlete nor the person without you by my side!!!! You push me to go places I never thought possible you are my ROCK THANK YOU for being YOU!!!! Let’s rock it CFSF, believe in yourself and your limits will be endless!!! Going to the games was the most unbelievable experience for me. Watching the video Matty put up just sends chills down my spine and tears in my eyes. I have ran marathons and done races and felt inspired but not the inspired you get from seeing the heart, determination, and mental toughness of the men and woman of Crossfit! I have learned that everyone needs goals and your body is always a work in progress. There is no limits on what a person can accomplish if they have the will and determination you can concur almost anything. If feel very blessed to have been a part of this team, I couldn’t imagine having this experience with anyone else. It was great getting to know each other and just being together. I hope and pray for the opportunity to represent Crossfit Sioux Falls next year and the years to come. Thanks everyone for all of the support and kind words you all had a hand in making our experience one we all will never forget!! I think each of us that went could fill up this entire page talking about the impact last weekend made on us. I knew I loved this before, but now more than ever. Just like at my level 1 seminar, I was reminded that this community isn’t just confined to Sioux Falls; the CrossFit stetches everywhere. These guys touched on it already, but the buzz in that gym was great. Every person competing would pour it all out to get done, and then get up and start cheering on and helping the opponent next to them. The crowd was the same way; everyone cheering for everyone. Most of our members have made the realization a few weeks after joining that this is about more than just losing weight or getting crazy fit. The way it changes you, the people you meet, and the experiences you make, are all so much bigger. Like Matty B said, I hope more people will make the trip next year, starting with the sectional qualifiers in Feb/Mar. Even if you have no aspirations of winning the title of “Worlds fittest man or woman,” having fun and competing is what it’s all about. I want to bring the max number of people (25) to sectionals next year to compete, and I have no doubt we can do that. If not to compete, come to support and bring some of our community with you. Make no doubt, the bar here at CFSF has been raised!